Server 'TEST_LINK' is not configured for RPC. This is a configuration thing with the Linked Server option called "RPC OUT". This is necessary to execute a procedure calls to go out to the linked Server. 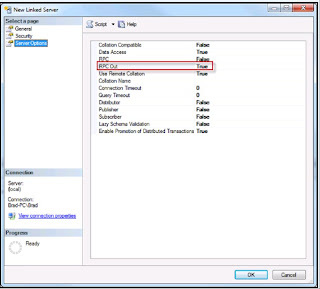 Where as, "RPC" option allows stored procedure call from the linked Server. For this case, I had to enable "RPC Out". I ran sp_helpserver and it reported RPC OUT isn’t enabled.